For my video storytelling project I had the opportunity to work with Sam Markus. Sam knew a few guys that are in a band here in Laramie know as Not My Weekend, so we thought they would make a good focal point for our video. We decided that we wanted to do a promotional video due to the fact we were unable to attend a performance by Not My Weekend. I really enjoyed this assignment because I find working with video very interesting personally. It was also a lot of fun because Sam and I pretty much just hung out with the band while we were getting footage and they are just a group of cool guys with some serious musical talent. I also really enjoyed learning how to efficiently operate Adobe Premier Pro. I feel as though knowledge concerning video editing could really be beneficial to me in the future. The only part of this project I didn’t really enjoy was trying to figure all the editing software out after we had our footage. We tried the trial version but it was more difficult and we really had no idea what we were doing. That was certainly frustrating. I was thoroughly surprised with how long it actually took us to upload all of the footage and audio we needed into the software. I thought this would be the quickest part but it pretty much took us an entire afternoon to get it all figured out. I was also surprised with how easy the editing process became once we had started to get the hang of it and had decided what we wanted in our video. Not only that, but it actually became rather fun. If I had the opportunity to do anything differently I would have liked to have a better plan, or outline, of the video before we gathered our footage. While we had come to a general agreement concerning what we wanted the video to be, while we were editing we realized there were certainly some more questions we would have liked to ask or different shots we would have liked to capture. Seeing as how I am very interested in sports there is a good chance that I could go into sports reporting. If I do this, the ability to edit my own videos will certainly be very useful and may even make me stand out during the application process. As I mentioned earlier, I also find video very interesting. I could definitely see myself editing videos as a hobby or even as side-work in the future. Obviously I will need much more practice, but that is certainly not something I will shy away from. For my live tweeting assignment I decided I would do the University of Wyoming women’s basketball game against the University of Idaho. It was actually a lot of fun to do because of how close the game was. I showed up early because I was also there for my internship with the athletics department. this allowed me to spectate pregame activities and post a few times before the game actually started. throughout the game I posted updates concerning the score as well as any other statistics I found applicable at the time. At the conclusion of the game I was able to attend the press conference.. This is where I attained my two direct quotes concerning the basketball game. All in all, I found this to be an enjoyable assignment. I like that I could just go to a game and tweet about it as it was happening. At times it was a little hard to keep up though. I had a few typos in my tweets due to the fact I was trying to type really fast while still paying attention to what was going on. I was certainly surprised at how difficult it was to keep up at times. That being said I would certainly liked to have had some practice before I started live tweeting. I think I would be much better at it a second time around just because I would know what to expect now. In the future I could certainly see myself using social media a lot. I feel like it’s an excellent way to connect with audiences as well as develop and spread my own personal brand and my work. It would certainly allow me to expose a much greater number of people to my work than I could without it. In class, we have been focusing on social media and its impacts. For this particular assignment, we have been tasked with comparing the social media presence of two companies. I have chosen to look at how both Nike and Reebok use social media. I myself am a big fan of Nike. However, not so much of Reebok, so I feel as though it will be interesting to see how both of these brands present themselves on social media. Both brands had a good presence on Facebook. Not surprisingly Nike had a lot more fans than the Reebok page had. However, it appeared as though the content posted by each page was pretty similar. A lot of it was simply advertisements for each particular brand. I will say for whatever reason I was a little more intrigued by the Nike page than the Reebok one, whether it be because of colors or content. From what I experienced these two companies seem to deal with twitter a little differently. While the Nike twitter page strongly resembles their Facebook page with the addition of a few gifs and some tweets to users, it was hard to find things like advertisements on the Reebok page. This is because they spend a lot of time tweeting with customers and twitter users, seemingly more so than Nike does. The Nike page was once again pretty similar to their other pages on social media. Obviously, they used pictures and videos to draw interest in their brand. Reebok was a little different because most of their pictures are just people working out in Reebok apparel. Nike actually had well produced videos and pictures. Reebok did have a pretty good presence on Pinterest. They showed off a lot of their apparel as they do on other platforms as well. Nike however, was not present on Pinterest. They did have a page titled NikeWomen though. This is likely because they have decided to narrow down their audience to women on this particular platform. Nike had a very limited presence on Snapchat. In fact, I was only able to come across a Nike Basketball Snapchat profile. Reebok on the other hand was completely absent from Snapchat. Once again both Nike and Reebok were very similar in their approach on LinkedIn. Other than the differences in specifics they looked nearly identical to each other as far as the layout of the page was concerned. Personally, I feel as though Nike is doing a very good job at presenting themselves on social media. They use it establish what their brand is all about, promote their products, and to convince people to buy in. If I were to offer them any advice it would probably be to become more involved with the fan base, which is hard because it is a large one. Being more personable could help them as well as maybe showing some of their products off a little bit more. Reebok is doing surprisingly well on social media. Obviously there not as well-known as Nike but I think they’re doing what they must in order to compete with brands like Nike. They have an expansive presence across multiple platforms, they show off their product, and try to sell people on a physically active lifestyle. As far as advice goes, I feel like they might do too much advertising on certain platforms and they could probably use some more videos or different types of media on their pages. I feel like the social media panel we had in class really aided in my ability to complete this assignment. Had it not been for them I really wouldn’t know exactly what to look for in an organizations social media. I found it extremely interesting to see what really happens behind the scenes and how different organizations approach social media in their own way. It turns out the audio editing process was not as easy as I thought it was going to be. Nonetheless, I actually found it rather enjoyable. I can see why this would be a very valuable skill to know when working in the journalism field. There were some points while I was editing that I thought I had a good idea that would fix a problem I was facing and it would actually make it a lot worse when I tried doing it. other than that though I didn’t experience too many problems, which was a welcome surprise to say the least. I actually began enjoying the editing process once I started to get the hang of it. It was kind of fun being able to clean up the audio and make it sound a lot better than it did when it was just the raw version of the audio. Like I mentioned earlier I was kind of surprised at how difficult it was at first. However, I was also surprised at how simple it was to learn. It didn’t take me very long at all to figure out how to use most of the tools ad to then go ahead and apply them to my project. If I were to restart this assignment knowing what I do now there honestly isn’t a whole lot that I would like to change. I felt as though the interviewing process went very smoothly. The editing was a little rocky at the start, but I was able to figure everything out for the most part and it made the entirety of the assignment seem to go a lot smoother. I’m also really happy that we had Doctor Brown come in and explain most of the tools ad how to operate Audacity. I feel like he provided a lot of much needed information that really helped me to do my best work on this assignment. Being a journalism major this certainly wasn’t the first time I’ve conducted an interview. That being said, I typically use my phone to record the interviews I conduct. Therefore, I was pretty comfortable while conducting this interview with Josh. I will say however, it was very different being the one interviewed. It was a bit difficult to continuously talk about one subject. It really put into perspective how those I interview likely feel while being interviewed. One thing that I enjoyed about this assignment is that I had the opportunity to learn more about someone I hadn’t previously met. I was able to sit down with Josh and talk about how he decided to study communications and political science. I also learned his reasoning behind his decisions and the kind of things he’s interested in. I also got a brief glimpse into what he was doing before he began attending the University of Wyoming. I really enjoy doing interviews for this very reason. I find it incredibly interesting to be able to learn more about people. Where they’ve been, what they’ve done, and their reasons for doing so. It’s one of the reasons I decided that journalism would be a good fit for me. This particular experience was made even more enjoyable by how easy it was to work with Josh. He was easy to talk to which made the interview process that much easier. He’s also an interesting guy so I was compelled to hear what he had to say. If I were to do anything differently I would probably choose a better space in which to conduct the interview. We did our interviews in one of the study rooms located in the classroom building. While it certainly wasnt a bad space to do an interview it was small and produced a bit of an echo. We were able to put our phones on a backpack so our voices didn’t really echo. However, my phone picked up some of the other noises in the room just from our movements during the interview. Overall, I feel as though the interviews went smoothly. We were able to make our interviews long enough while maintaining an interesting flow of information. 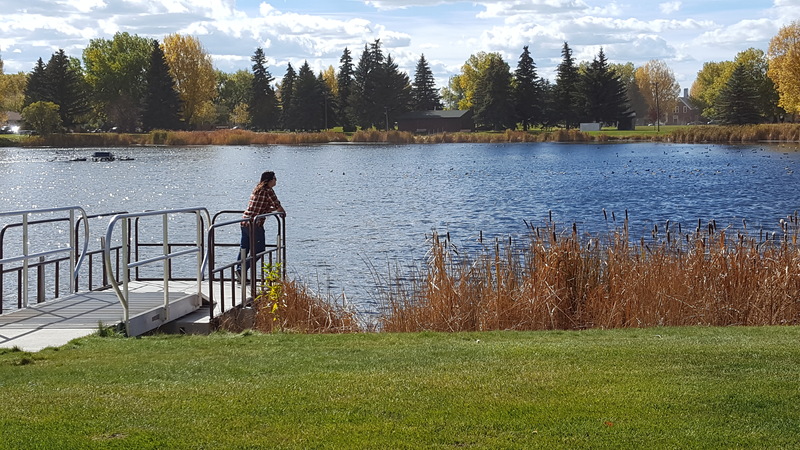 Soothing Waters: Megan Shamley, a student at UW, relaxes and listens to music while looking over the water at Labonte Park in Laramie after class. This photo would certainly be categorized as a feature photo. I came across this photo opportunity while walking through the park, thus making it a found situation. In this particular instance I walked u and started taking pictures and then when I felt as though I had a few good ones I proceeded to walk up and introduce myself and tell her what exactly I was up to. She simply wanted to take a look at a few of them, but was totally alright with it. I would say this photo definitely uses the rule of thirds as a creative device. 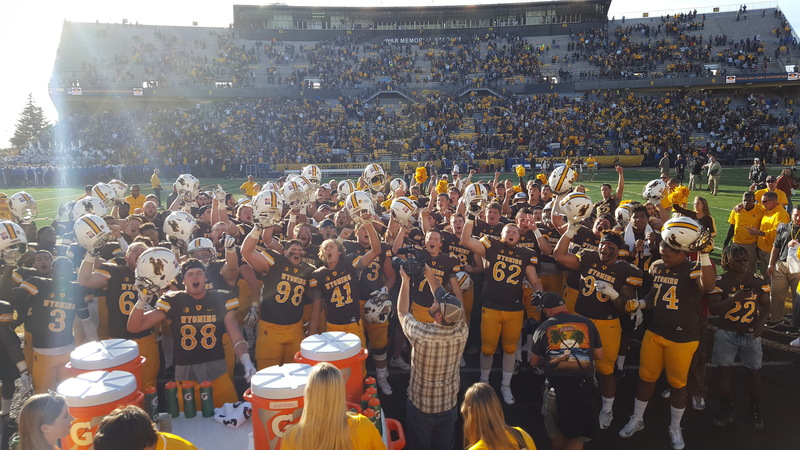 Rootin’ Tootin’ Cowboy Win:The UW football team celebrates with the student section after defeating the Air Force Academy to conclude homecoming week in Laramie. This Photo would be categorized as a sports feature. This is because it captures the celebration and jubilation after the football team won Saturday afternoon. obviously this was a well advertised game seeing as ho it was homecoming week here at the University of Wyoming. I was at the game and happened to get some pretty good seats but decided to move once the clock hit zero so I could celebrate with the team, and that’s where I snapped this picture. Obviously it was a very exciting environment because UW had just handed the Air Force Academy their first loss of the season so it was pretty loud in the student section.This photo wasn’t an easy one by any means due to the fact that the sun was setting just outside the frame which caused some difficult lighting obstacles. As far as creative devices go I would probably say that color, because of the uniforms, and rule of thirds are used. 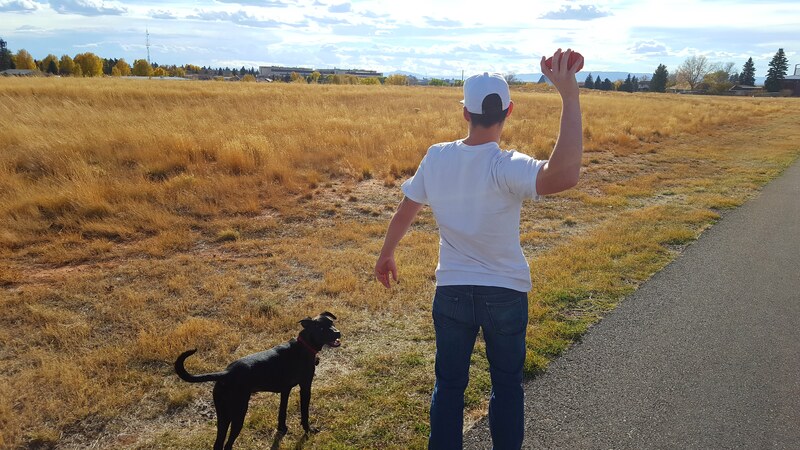 Fetch: Clay Schaffner, a UW student, plays fetch with his dog in an open field just north of the UW campus. While this isn’t necessarily a sports action shot it is an action shot. However, it would likely be considered a feature photo. This was just another scenario in which I stumbled across something i considered photo worthy. I asked if it would be cool if I took some pictures for this class and he didn’t seem to mind very much. While I thought I might get some contrast in this shot the sun was still too high to really cast any good shadows. That being said, I feel like establishing size, because the dog was still a puppy, and texture because of the tall grass in the field. 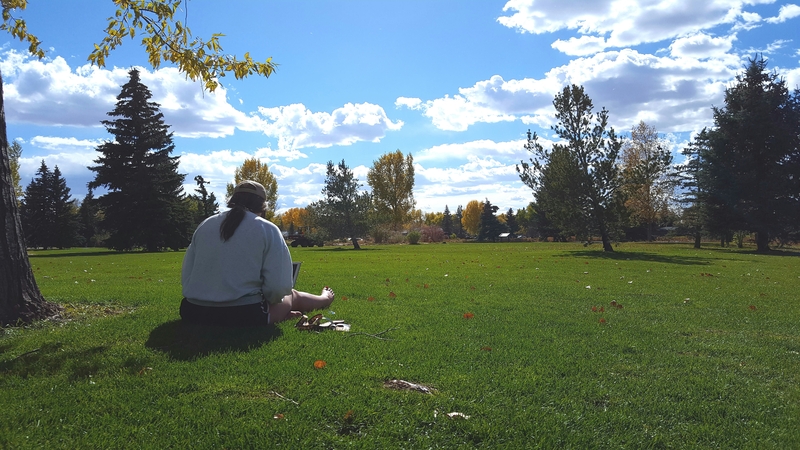 Fall Study Session: Meagan Serex, A UW student, works on schoolwork at Labonte Park here in Laramie. This photo would also be a feature shot. I came across Meagan the same day as I took the first photo. I actually saw her while driving past the ark on my way home but decided to stop and see if I could practice my photojournalism skills. As a student she was very understanding of what I was doing and was very kind. This was actually one of the firs photos I took so I was a little nervous. I would say rule of thirds as well as color because of the leaves are resent in this photo. The student section at War Memorial Stadium celebrates after the UW football team defeated the Air Force Academy. I would consider this photo to be a sports feature because of the fact that it is capturing the jubilation of the fans in the stands. This photo as a little awkward because while everyone was facing the field, I was in the front row facing them. As you might’ve guessed this was toward the end of the School song so everyone was pumping their fists while spelling cowboys. This photo definitely uses color as a creative device due to the fact that there’s so much gold and some brown clothing. It really gives it a cool appearance. This past week I had the opportunity to go around and take numerous photos as we entered the photography portion of the class. This certainly wasn’t the easiest of tasks seeing as how I have no real background, nor experience, concerning photography. However, using the tips and tricks I learned in class I was able to produce what I consider to be five photos worthy of posting. Prexy’s Pasture: The vastness of Prexy’s is captured in this photo. The dominant creative device in this photo is viewpoint. 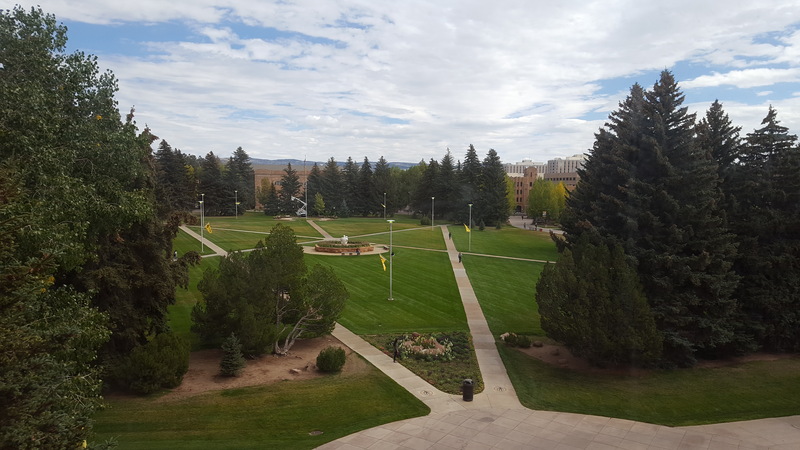 Most people who have ever been on the camps of the University of Wyoming have seen Prexy’s Pasture. However, most probably haven’t seen from a little higher up. Because of this I believe viewers will find this picture appealing. I would also say that depth is being used in this photo. As you can see there are a couple of people on the sidewalk that really help put the size of Prexy’s Pasture into perspective. The use of people in photos is a fairly common practice when a photographer wants to use depth as a creative device. The dominant creative device in this photo would be the rule of thirds. While the statue is the focal point of the photo I thought it would be more pleasing to the eye of it was placed on one of the third lines. I would also say that color was used as a creative device in this photo. 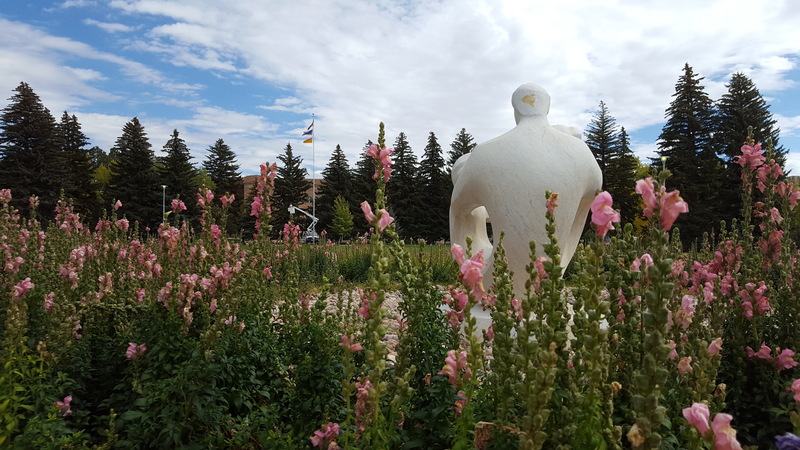 The statue stands out from the flowers in front of it which helps to draw the eye of the viewer to the focal point of the photo. 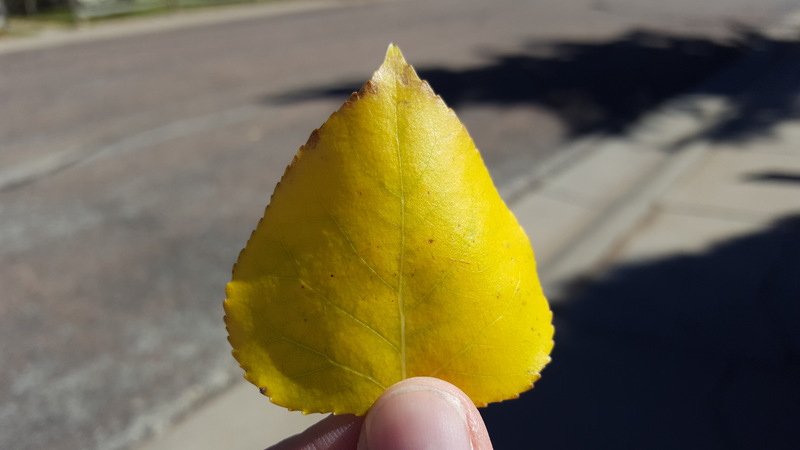 A Fallen Leaf: This photo shows some of the colors one would expect to see as Fall begins. The dominant creative device in this photo would be cropping. This is because only the leaf and a fingertip are visible in this picture. The tree, and everything else, is not included in this photo. that leaves only the focal point to be seen by the viewer. It also makes the photo more appealing because of the fact that there are no distractions. Another creative device used in this photo is color. when the leaf is placed against the dull background of the road it really stands out and demands the viewer’s attention. 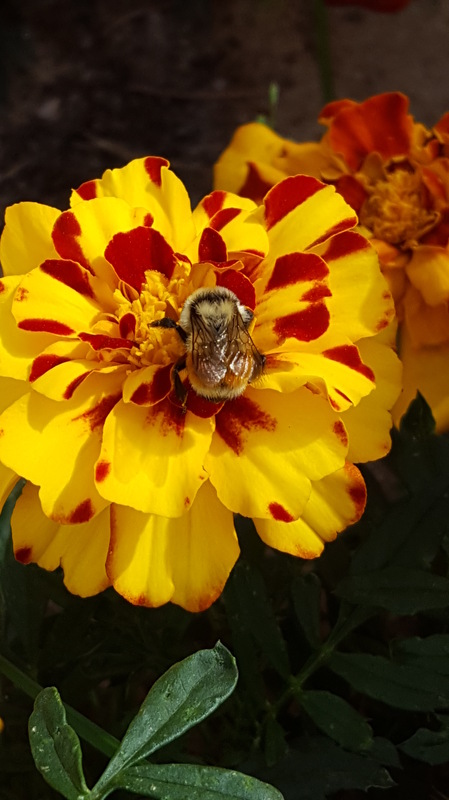 Not So Busy Bee: A bee hanging out on a flower. I believe the dominant creative device in this photo is texture. whether it be the smoothness of the flower petals, the fuzziness of the bee, or the interesting texture of its wings. As a viewer I want to touch everything in this photo. One could certainly say that establishing size is used as a creative device in this photo. Assuming this is a normal sized flower, one can gain a sense of scale and realize how small the bee is in this photo, thus attracting the eye to the bee once more. Sunflower Smooth: A close up of a sunflower. The dominant creative device in this photo would be focus. 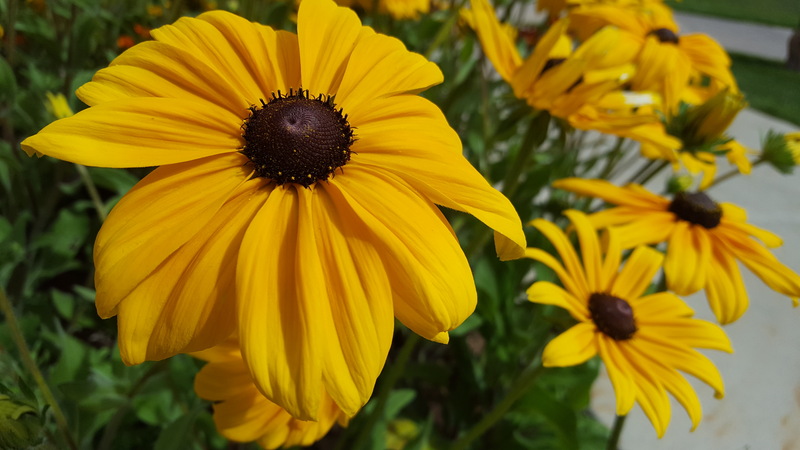 The focal point is the flower on the left because it is the only one that is totally in focus. the rest of the sunflowers are a bit blurry so they don’t really attract the attention of the viewer. Texture is used as well in this photo. The petals of the flower appear so smooth and make the viewer want to glide their fingertips across the top of the petals. I can honestly say that I had no idea how much work actually went into photography before this assignment. I simply thought I would take a few pictures and call it good. However, there are so many different creative devices, and he amount of pictures required to get a good photo is almost ridiculous. The only thing I would consider doing differently during this assignment would be to take even more photos. I’ve come to learn the only way to get good photos is to take as many as possible.